I love fresh fruit. This is my favorite time of the year when there is a large variety of fresh fruit both at the grocery store and local farmer's markets. Of all the fruit available my favorite by far is blueberries. I love blueberries by themselves, with cereal, in baked goods, pretty much anyway they can be used in relation to food. My two boys have also fallen in love with all types of berries and will literally eat pounds every week. I have to hide berries that I buy for baking or they will be eaten within a day. This week I was pleased to find a great batch of blueberries at my local store and was excited to find a recipe for The Best Blueberry Muffins in the July issue of Parents magazine. This recipe has 7 ingredients. It takes 25 minutes of total time, 10 minutes of which is active and makes 12 muffins. I did make a few modifications. First and most importantly I substituted unsweetened applesauce for the 1/3 cup vegetable oil. Since I used applesauce my cooking time was increased by approximately 8 minutes. I also turned my muffin pan 90 degrees halfway through the baking time to promote even browning. Instead of using a ice-cream scoop to fill the muffins I just poured it straight into the pan. I don't have a dishwasher so I try to save time on dishes as much as I can and the ice-cream scoop seemed more work than it was worth. Finally, I chose not to use paper liners. I know a lot of people love them and they look great on a plate. However, I prefer to just put the muffins straight into the pan. My two boys eat the majority of the muffins that I make and would just rip the liners into shreds. I followed the remainder of the recipe as written. My two boys loved this recipe. They didn't notice that I used applesauce instead of oil and the taste of the fresh blueberries was delicious. These were great for breakfast for my kids and I. By cutting down on the oil they make a great way to get more fresh fruit into my family's diet without being overly high in fat. Overall a delicious way to use fresh berries. 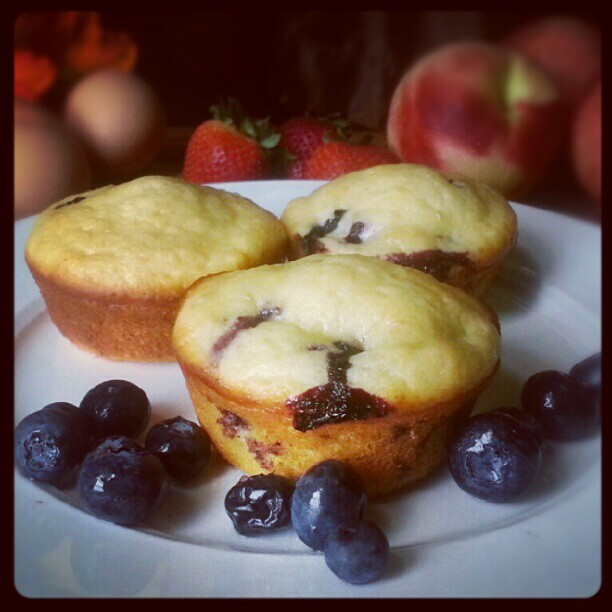 For the recipe go to The Best Blueberry Muffins. These muffins looks fantastic!! I love that they are a bit healthy - using applesauce instead of oil!! I'll have to try them! Thanks for the sweet comment :) I love that they are healthier with the applesauce also, makes for a better breakfast or snack option! Thanks :) I love baking with applesauce also, it's a great substitute!